I'm sure it comes as no surprise that I follow a few foragers on social media, people like Hank Shaw, Langdon Cook and Monica Wilde. 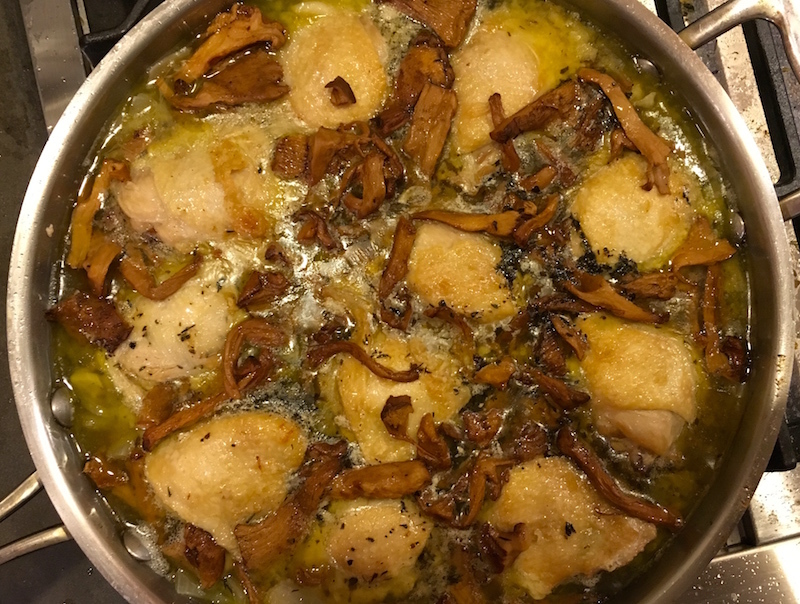 I also have friends who forage professionally, like Jack Czarnecki and his sons Chris and Stefan, of the mushroom-centric Joel Palmer House in Dayton, Oregon. 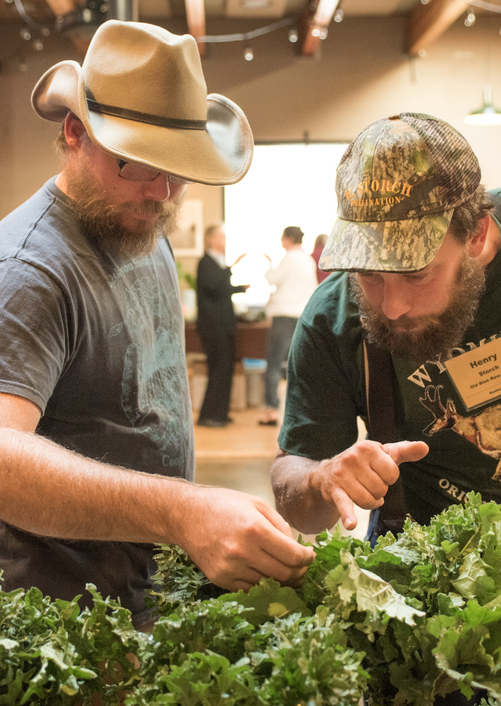 Then there are the myriad chefs, cooks and other folks I know who pull on their wellies and get out in inclement weather to hunt—not pick—our wild edibles. 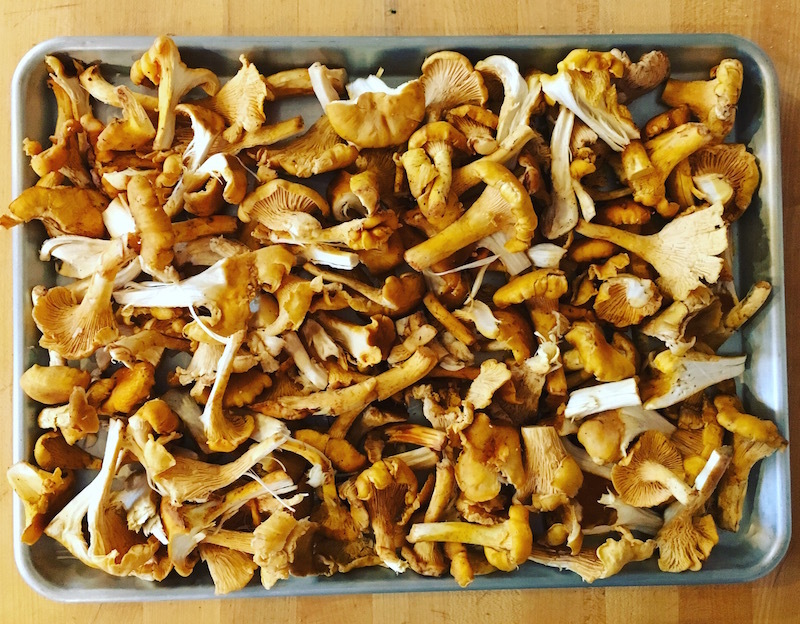 So when I start seeing photos of wild-foraged chanterelles circulating around the ether, it gets my heart pining to head out into the woods myself with a basket and high hopes. I actually did get to do some foraging this last weekend at Fort Stevens State Park near Astoria on the Oregon coast, but it's more well known for its porcini mushrooms, or boletus edulis, than chanterelles, due to the mix of trees planted on its former sand dunes. 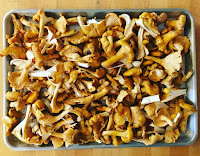 Luckily for Portland folk there are plenty of wild chanterelles available at local farmers' markets and stores—some even have special sale prices—so I've been able to stock up on those chanterelles in case I don't get out in the forest soon enough to catch them at their peak. An hour of roasting in the oven at 400°, draining off the juices a couple of times for the deliriously delicious mushroom stock that'll get used in risottos and chowders, and then popping the roasted mushrooms into zip-lock freezer bags. Then I'll have plenty of braises, soups and other delights to look forward to this winter. 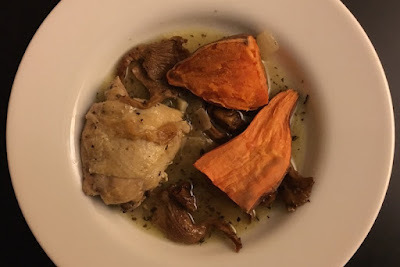 So far we've had chanterelle quesadillas (thanks Kim Severson), a stunning mushroom chowder and last night a coq au vin with roasted yams that blew away any other chicken dish we've had lately. Fast, dead simple and so delicious, it was lucky that there were any leftovers for Dave to take to work for lunch today. Seriously, this is a company-worthy dinner, and would be more than adequate using regular mushrooms. But to send your guests into the stratosphere, invest in a pound of the wild things. You won't regret it. Preheat oven to 375°. Bring a medium pot of water to boil. Cut yams in quarters. When water boils put yams in boiling water, let it return to a boil and cook for 3 minutes. Remove and transfer to baking sheet, skin side down. Place in oven and roast for approx. 45 min. or until tender. Turn off oven until chicken is done and serve alongside. While yams are baking, place a large skillet over medium-high heat and add oil. Heat until oil shimmers, then brown the thighs on both sides in batches, removing to a plate as they're browned. When thighs are browned, add onions to the fat in the pan and sauté until translucent. Add garlic and chanterelles and sauté until tender. Add herbs and stir in, then pour in wine. Put chicken thighs into the pan with the vegetables and wine. Bring to a boil, then reduce heat to a simmer. Cover and simmer 45 minutes. Add salt to taste. Serve. 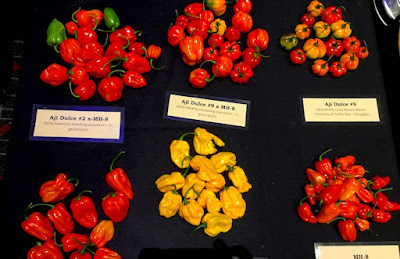 This blog post was developed in collaboration with Hopworks Urban Brewery, a supporter of Good Stuff NW, though the words are all my own. 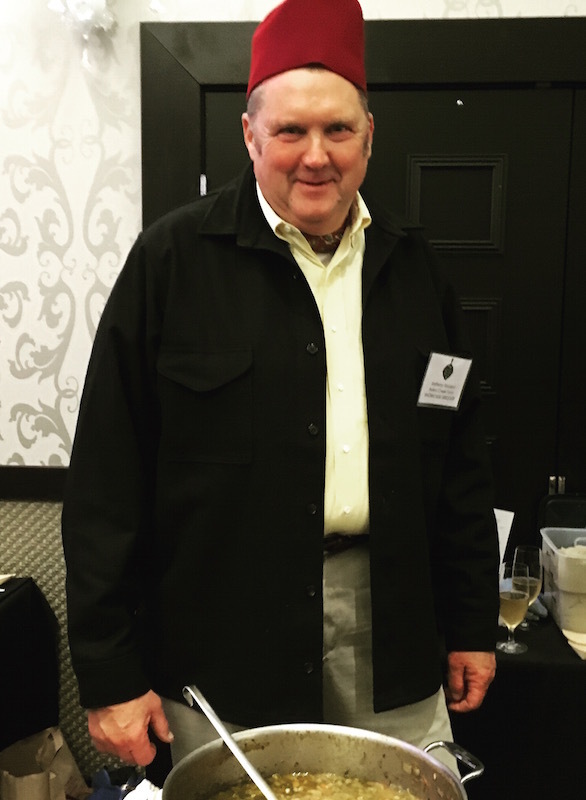 "It was a surreal moment because it was hard to believe that a company that I look up to as a business owner had just dialed my number and asked to make a beer with us," Ettinger recalled. 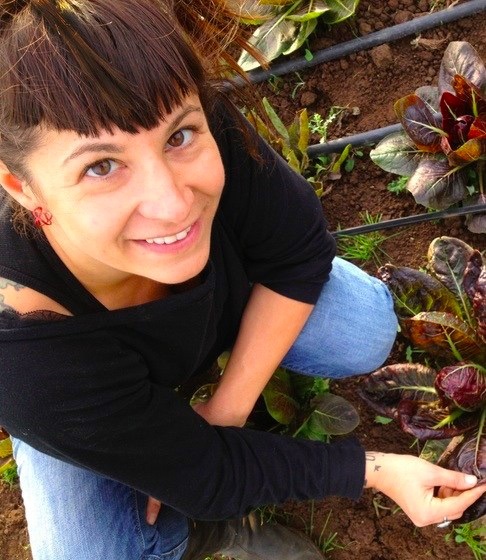 "That week we met up and our team learned about Kernza for the first time." Patagonia Provisions itself is dedicated to supporting a farming method known as "organic regenerative agriculture"—one that restores soil biodiversity, sequesters carbon and grows crops efficiently without chemical fertilizers or pesticides. Better yet, this method keeps harmful effluents out of the environment, improving the health of surrounding communities and the people in it. 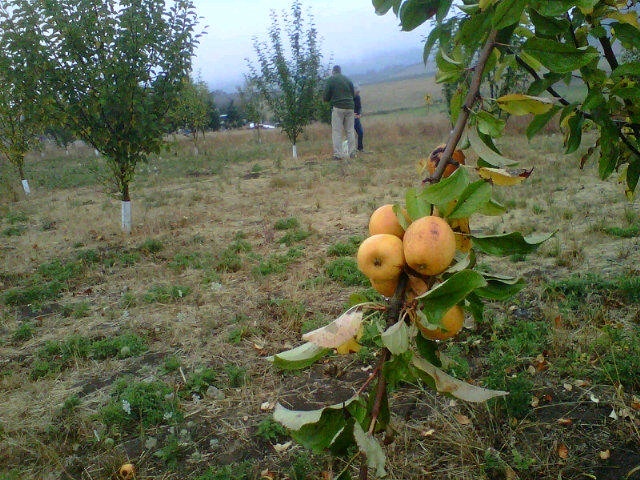 Call it organic farming with benefits. Kernza has an impressive root system. Kernza wheat fits into this picture because, as a perennial crop, it doesn't have to be replanted every year like other types of wheat. That means it allows long-term storage of carbon dioxide in the soil (called carbon sequestration), rather than releasing it into the air when the soil is plowed each year. Because Kernza lives on from harvest to harvest, its roots can grow to 10 feet in length and are so efficient that the plant needs much less water that other strains of wheat. 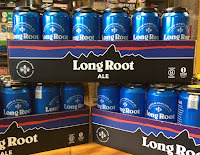 These long roots also help to reduce erosion by stabilizing the soil, and the plant itself absorbs more atmospheric carbon than annual grains and thrives without the use of pesticides. 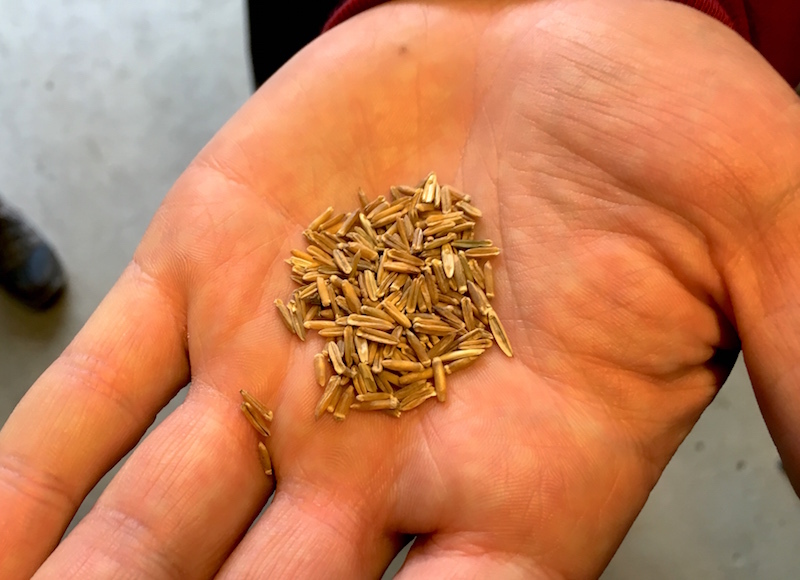 Originally a Eurasian forage grass called intermediate wheatgrass (Thinopyrum intermedium), a grass species related to wheat, it was selected by researchers at the Rodale Institute and the U.S. Department of Agriculture (USDA) as a promising perennial grain candidate. In 2003, The Land Institute, which works to develop staple foods without compromising cultural and ecological systems, took the grain into its traditional breeding program—think Mendel's peas rather than genetic engineering—and began selecting for traits like yield, disease resistance and seed size. Hopworks production manager Justin Miller. 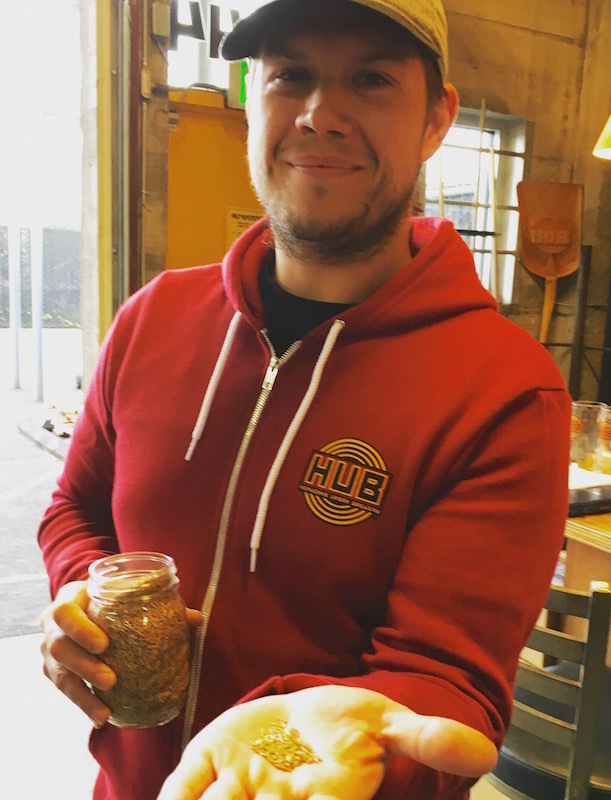 "It was very exciting for us," Justin Miller, Hopworks production manager, said of the opportunity to be the first to work with the organic, sustainable grain. "It very much fits into what we do here at Hopworks." 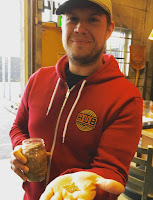 Indeed, Hopworks is the first commercial brewer to make a beer using Kernza as an ingredient. Miller said it took eight test barrels—at 31 gallons to the barrel, that's more than 240 gallons of tests—and much, much tasting to finally come up with a beer that the teams at both Hopworks and Patagonia Provisions were happy with. Hopworks even went so far as to put a test batch on draft at its Portland pubs, so if you had a pint of Prohibition Double Secret Ale, you got an early taste of it. 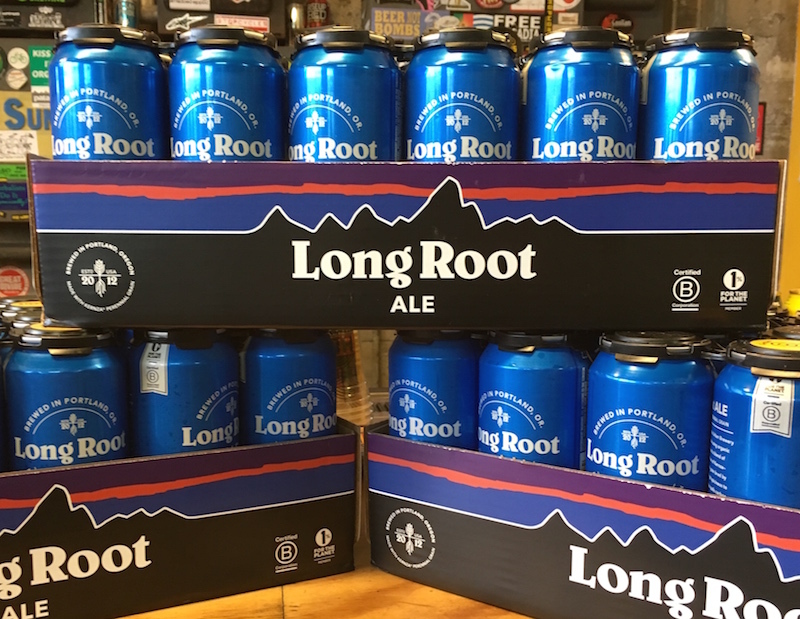 The final product, dubbed Long Root Ale, contains 15 percent Kernza along with organic two-row barley, organic yeast and a blend of organic Chinook, Mosaic and Crystal hops. The flavor is that of a classic Northwest-style pale ale, a bit peppery with a balanced, clean finish and a sessionable 5.5 percent alcohol-by-volume. It's being rolled out at most Whole Foods markets up and down the West Coast, and while Hopworks is the first to use Kernza to make beer, Ettinger is convinced the grain has a promising future in the industry. "Kernza is really paving the way for future discussions about other commodity grains that we use to brew," he said. 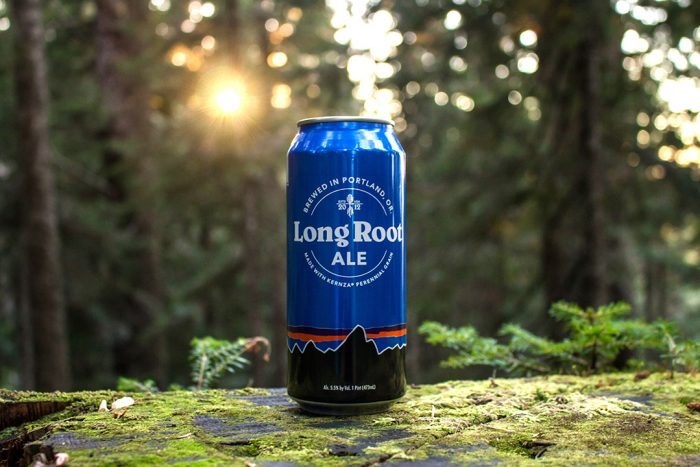 "As organic brewers we are really excited about the ‘grain to glass’ model, and Long Root Ale is just that." Top photo by Chad Brigman. 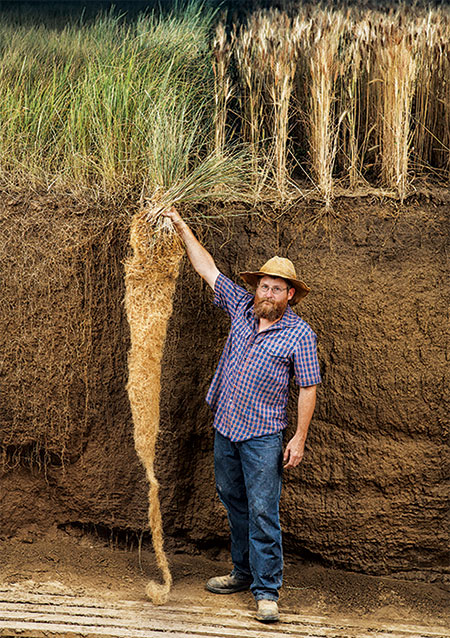 Photo of Kernza roots by Jim Richardson. When it comes to eggs, scrambling has been my technique of choice since I was a kid. On Saturday mornings my two brothers and I would watch cartoons as our parents slept upstairs, laying on the floor with our noses practically touching the screen in a position my mother said "will ruin your eyes." At a certain point we'd break for breakfast, my brothers hauling out plastic bowls, milk and boxes of cereals with names like Cocoa Puffs, Frosted Flakes and Sugar Crisp. I don't know what was wrong with me, but I wasn't enamored with the cereals I considered "too sweet," preferring instead those with less (but by no means without) sugar like Wheaties and Grape Nuts. I even had a flirtation with various shredded wheat varieties, but that soured when it became too much like eating a bowl of twigs. My mother's cast iron skillet. 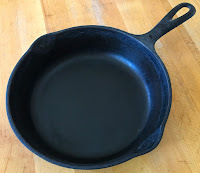 At some point in elementary school I was old enough to be allowed to use our electric stove without supervision, and I started making scrambled eggs in my mother's small, well-seasoned 8" cast iron skillet which sits in my kitchen to this day. It took practice, but I learned to manage the heat and not burn the butter and to crack the eggs without getting bits of shell in the mix—biting down on a shell in a creamy mound of scrambled eggs still sets my teeth on edge—as well as figuring out how much to stir them to give them that not-too-curdy, not-too-dry creaminess. I continue to make them to this day, though I've varied the original butter-egg-milk-salt mixture of my childhood to a butter-egg-salt-sprinkling of cheddar combination that suits my current tastes. Dave has mastered the omelette after watching Julia Child's technique on our collection of French Chef DVDs, and I've grown fascinated with one Mexican version, chilaquiles (pron. chee-lah-KEY-lays) that includes chopped tortillas, tomatoes and onions. 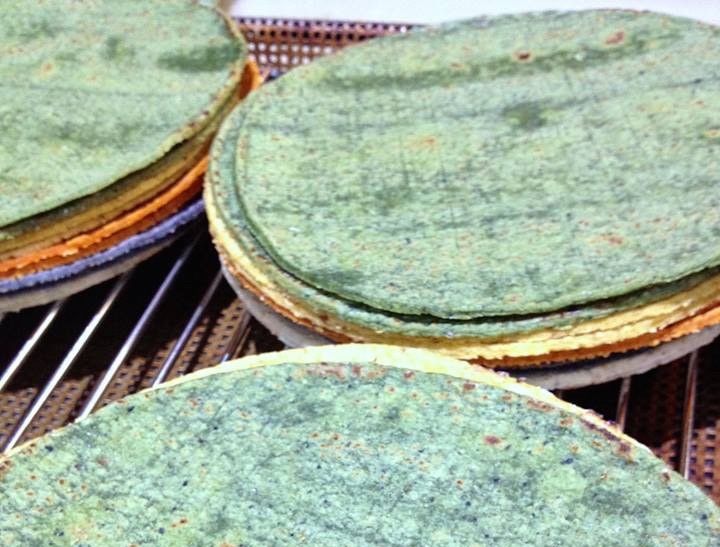 Beautiful tortillas from Three Sisters Nixtamal. 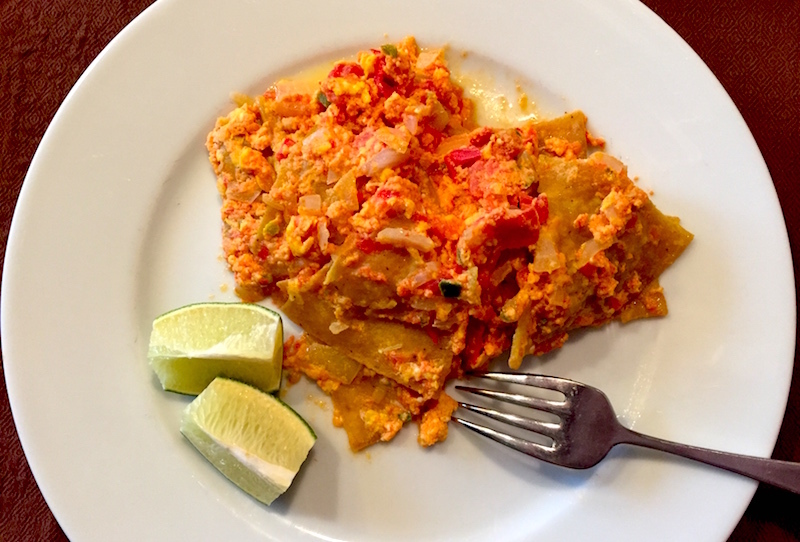 Sainted researcher and chronicler of Mexican cuisine, Diana Kennedy, has a superb version of chilaquiles in her The Tortilla Book that we like to make with corn tortillas; flour tortillas make them too doughy. And, fortunately, the best tortillas I've had lately, from Portland-based Three Sisters Nixtamal, are now available in local stores. Made with organic corn, the dried kernels are combined with lime and water in a process called "nixtamalization" that causes the kernels to swell and enriches the nutrients in the corn. The kernels are then washed, drained, ground and combined with water and salt to make masa dough, which is then pressed into tortillas. I can't recommend them highly enough, and they add a deep, authentic flavor to the chilaquiles. For a devoted scrambled egg fan like me, these not only make a stunning addition to the weekend breakfast repertoire, but would even make a great dinner paired with simmered black beans and a green salad. In a frying pan over medium-high heat, pour in the oil to depth of 1/4" and heat until it shimmers. Add half the tortilla pieces and fry until they are hard but not browned. Drain on a paper towel and fry the remaining tortilla pieces. Keep warm in a low oven while preparing the other ingredients. Drain the tortilla frying oil from the skillet and add 3 Tbsp. fresh oil. Heat oil over medium-high flame until it shimmers, then add onion, tomato and chiles. Cook until tender, about 5 minutes. Add the beaten eggs, salt and tortilla pieces to the skillet and cook, stirring gently, until the eggs are set but not too dry. Adjust salt to taste and serve. I can always tell from the twinkle in contributor Anthony Boutard's eyes (not to mention his prose) that he is on the verge of springing something surprising on his audience. In the case of his latest project, outlined below, he practically had laser beams shooting out of those baby blues. Several years ago Chef Naoko Tamura handed us a jar with soured (fermented) rice. As she described it, just some rice grains, salt and water. The milky liquid had a soft and appealing acidity, not sharp as in vinegar or lemon, and retaining the essence of the grain. 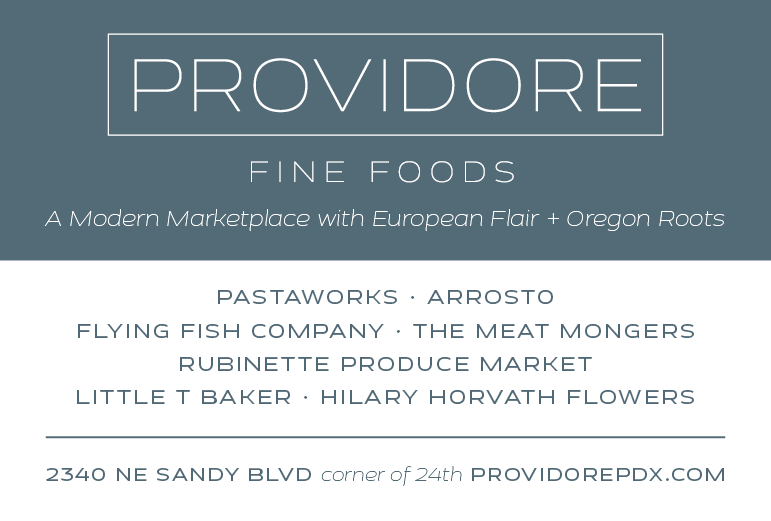 The flavor lingered and a nascent project lodged in an overloaded "to do" synapse. Around the same time, our research for Beautiful Corn led us to Romania where corn worked its way into the national diet and was a very important export crop. The Romanian Cook Book by Anisoara Stan (Castle 1951) devoted a chapter to mămăligă dishes—what we call polenta/grits/mush. Going back a couple of millennia, mămăligă was a porridge of millet, but corn edged the smaller grain aside in the late 19th century. 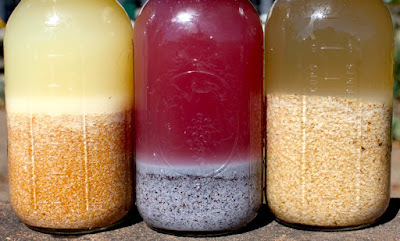 Left to right: soft red wheat (after 24 hrs. ); Peace, No War corn (24 hrs. ); Migration Barley (0 hrs.). Another chapter covered the region's acidic soup, the ciorbă. Traditionally the liquid base for the soup is from soured barley or wheat bran, called borş, though over time lemon, pickle and sauerkraut juice provided a substitute for the soured grain base. Stan lamented that the younger generation was not willing to devote the time necessary for traditional foods, a familiar refrain in most cultures. (Today, the companies Maggi and Vladi offer processed versions of borş in Romanian supermarkets.) A bigger factor was probably the loss of small mills as that nation focused on corn for an export crop, as a result freshly milled small grains and their bran became hard to find. 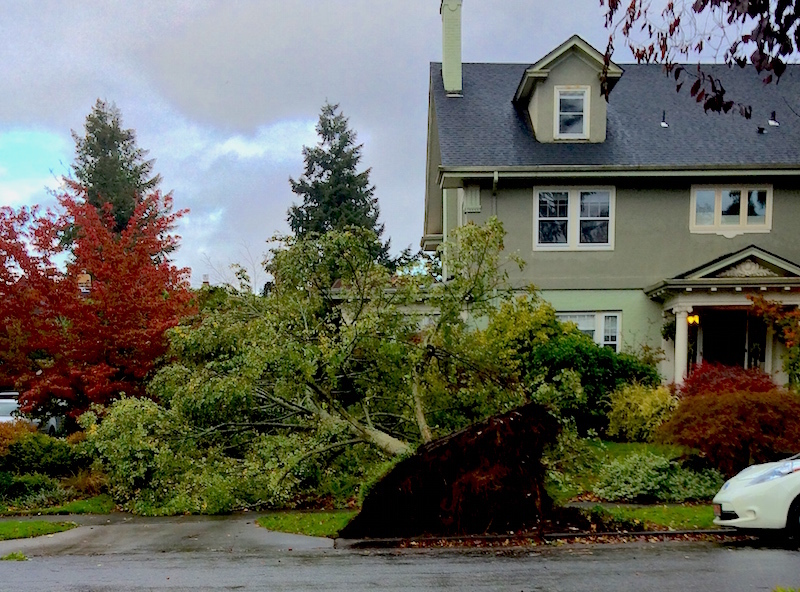 A similar loss of small mills happened here in the United States around the same time. Another "to do" synapse occupied. Soups made from soured grains are a tradition in other parts of Eastern Europe. In Poland, white borscht is made from soured rye or wheat flour. There are also regional soups prepared from soured cornmeal and oatmeal. However, every time our interest in soured grains was piqued, it quickly abated when we saw the recipes; they were more potion than proportion, more magic than method. The recipes lacked the utter simplicity of Naoko's soured rice and, as we contemplated the various ingredients, great potential for funk or discordant flavors. We weren't ready for the ordeal of failed fermentation, the awkward moment of wondering if it really should taste and smell that way. Fermentation complete and mixture strained. Last autumn, we started milling barley. With a supply of fresh, top quality bran in the milling room the raw ingredient was at hand, but we still had to work out a reasonable fermentation protocol. In August, our farm fellow, Myrtha Zierock, left a jar of fresh bran on the kitchen counter leftover from preparing her farewell pflaumenkuchen. We were pickling some cucumbers that day and Naoko's simple preparation slipped out of the synapse's embrace. Hmmm. Why not put the bran in the extra pickling brine, leave it on the counter and see what happens? Into the jar it went. After a couple days the liquid developed a pleasant aroma, and about five days later it started its lava lamp stage—hypnotic bouts of belching. The next day, we strained off the milky liquid. 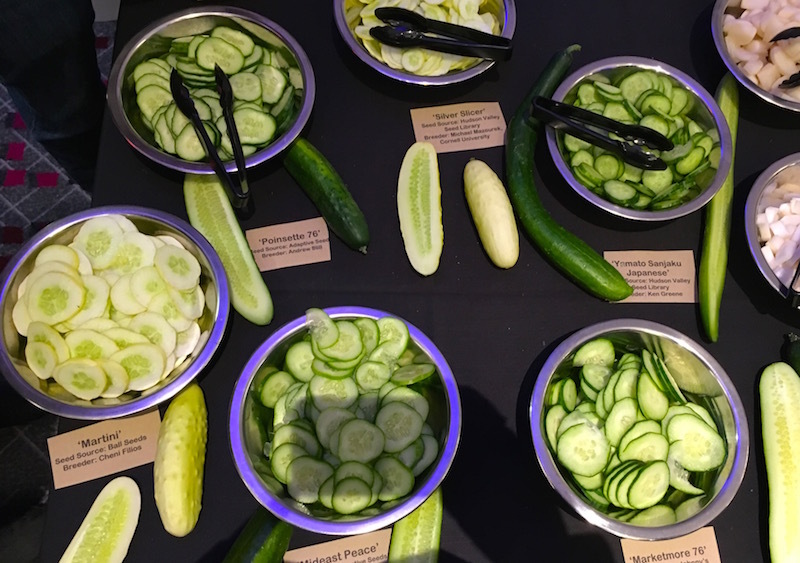 The pH hovered around four, essentially the same as pickle or sauerkraut juice, but it had that soft acidity and grain flavor we remembered from Naoko's soured rice. Despite its acidity, we could drink it from a glass without a shudder. Alas, Myrtha was working her final night at Lovely's 50/50 so she never tasted the borş she initiated. After refrigeration, the fines drop to the bottom of the jar. Soured grain recipes specify either bran or flour for the fermentation. We have decided to use coarsely ground, unsifted grain containing bran, middlings and flour. This coarse grind offers up a bit more body to the ferment. 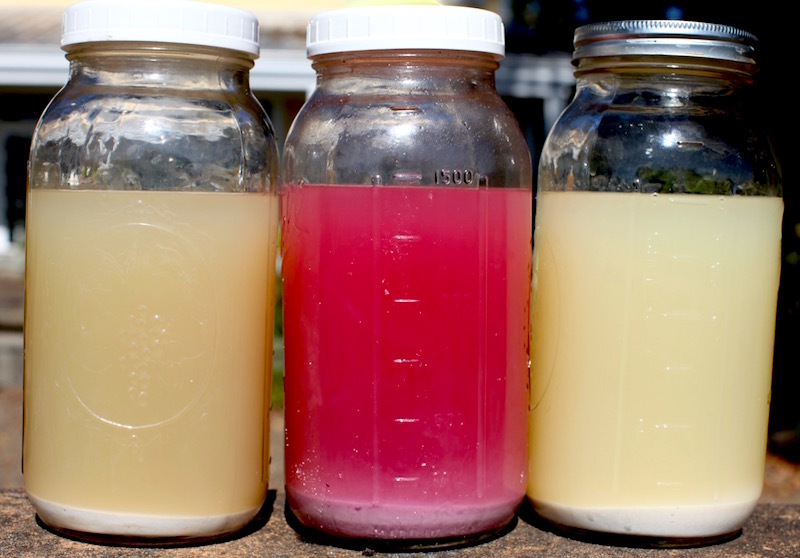 The fermented liquid is very cloudy but becomes clear overnight as the fines settle. This provides a choice of styles, clear or milky. We have since made several batches to be sure we have the proportions and fermentation times right. Our goal is to make it as easy as growing a jar of Sea Monkeys—pour package in jar, add water, mix by shaking not stirring, and wait for life to manifest itself. We have settled on a proportion of 28 grams of salt to 200 grams of coarsely ground grain. The dry ingredients go into a two-quart mason jar, and the jar is filled to the top with very warm water. Put on a lid, shake well and then loosen the lid a bit so the jar won't explode. Leave on the kitchen counter for four to five days. We screw the lid tight again and shake the jar two or three times a day, remembering to loosen it after shaking. 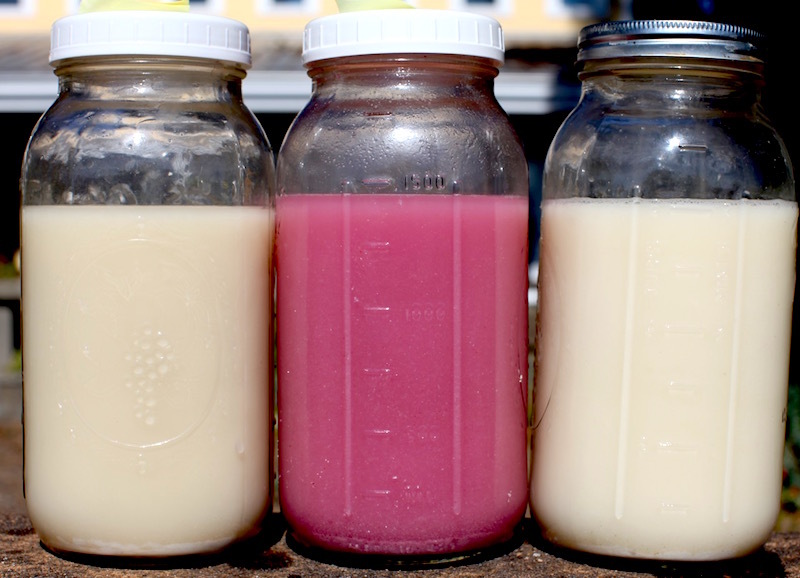 The liquid is strained into a clean jar and refrigerated. The yield is roughly 1.5 liters of borş. The fermented liquid is a sophisticated and nourishing base for soups that adds a body to the dish much in the same manner as a meat-based stock. The traditional ciorbă contains meatballs, meat or fish, but mostly as an accent or flavoring in a combination heavy with vegetables such as knob celery, potatoes and fennel, as well as herbs such as lovage. For vegetarians, soured grains open up a whole new source and diversity of stocks as yet unexplored in the United States. 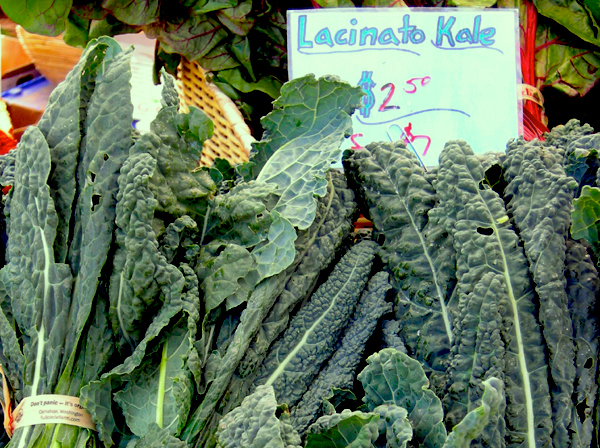 They are cheaper to produce than classic vegetable stocks and more nourishing. Just seven ounces of grain yields one and a half quarts of flavorful stock. Simple in flavor and production, no toiling over the stove, no wondering if the vegetables have been over-cooked. They provide the acidity to offset the sweetness of root vegetables and showcase the subtle flavors of fungi. 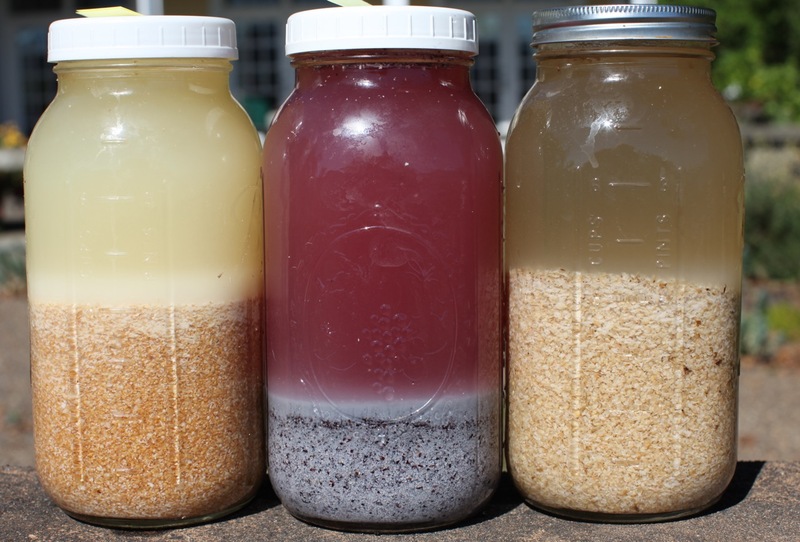 Soured grains also meet the needs of raw food devotees. Oh yes, Myrtha, we did brine the Peace, No War cornmeal you left in the refrigerator as well. It started out a dark purple and, as the broth acidified, it turned a bright fuchsia pink. The anthocyanin in corn is a pH indicator. Talk about a stylish borş. Anyway, we hope we have made this as easy as growing Sea Monkeys and maybe some of you are willing to leap into the wonderful living world of soured grains.